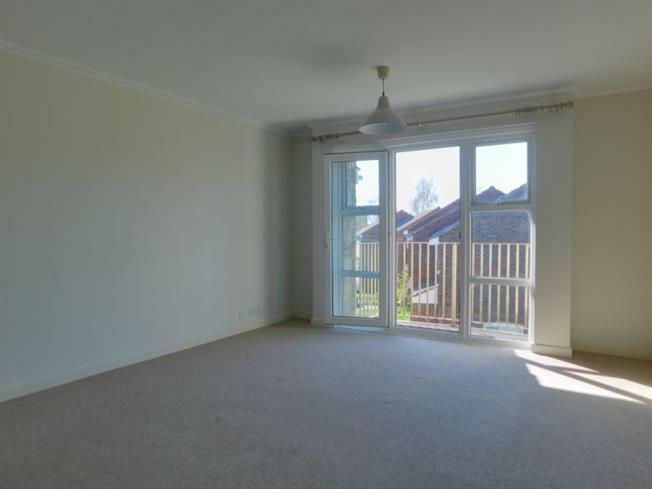 2 Bedroom Upper Floor Flat For Sale in Wells for £170,000. No Onward Chain. All White Goods Now Included In The Price! Beautifully finished two bedroom top floor apartment, that boasts tremendous views to the front and rear of the neighouring hillside and Wells Cathedral. The property has the significant benefit of a garage, off road parking and a balcony to enjoy those views from! Call now to view. A spacious apartment that has been well maintained throughout, with upvc double glazing and upgraded, efficient electrical heating in each room. The two bedrooms are both double rooms boasting views of the hillside. The lounge has a lovely range of windows and a door that allows access on to the balcony that provides a lovely view of the Cathedral. The kitchen / dining room is once again more than you might reasonably expect - a well fitted kitchen with a breakfast bar and space for appliances, ample dining space and two windows offering views towards the Cathedral again. The bathroom is fitted with a three piece suite that includes a bath with a shower over. There is also the added benefit of the loft access and storage space. There is a light and ladder for ease of use. The garage is located in a block opposite the main residence. The number of the garage is 29. Off street parking is available in the designated parking areas.